I finished up my Sparkle Plenty quilt top yesterday. I’m very pleased with how it turned out. Once I was done I stuck it up on the design wall for a picture. I was admiring my work when it hit me how far I have come in quilting when compared with the first quilt top I ever pieced. I was excited to see that my boring work of squaring up the each and every one of those 108 HST blocks paid off. 95% of my corners and points match up perfectly. The quilt top actually looks nice and square (there is a slight distortion from the camera.) On the back my seams are laying nice and flat. The seams are also 1/4” like they are supposed to be. I share this not to show off and say “hey look at me, I’m an awesome quilter, neener neener!” I share it to show you what you can accomplish if you stick with quilting. I started quilting/sewing 7 years ago and my first quilt top has much to be desired. It is so wonky, not square and full of mistakes. I had no idea what bias meant. I had no clue that fabric needs to be cut a certain way in order to minimize stretch. Or that once cut it needs to be handled with care to avoid distortion. I didn’t know that you had to be careful with the iron as well. A 1/4” seam allowance? HA! some of the seams on my first quilt were non existent in some places. I literally had to go back and repair the quilt top (a few years ago) so that it could be quilted. Still I have loved learning without restraint. The only quilting class I have ever taken was a free motion quilting class for beginners and I took it after I had been quilting for about 4 years. If I had started my quilting journey with proper “training” I think I would have held myself back from trying things that sound too difficult. 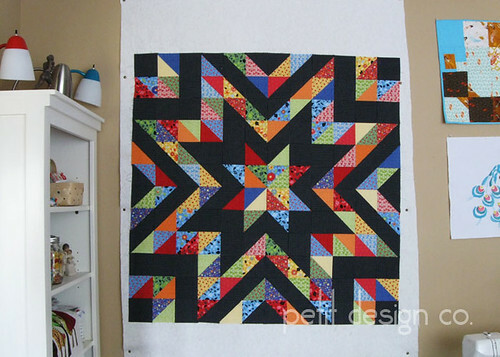 If you are just starting out on your quilting journey, DON’T give up! Don’t compare yourself to other quilters. Just give your project your best effort and as you practice, practice, practice – as with all things, you’ll get better. Learn those little tips and tricks from fellow quilters that will help your quilting become awesome. Be willing to try different tips, but also be willing to discard those that don’t work for YOU. There are many ways of achieving the same result and no one way is the right way to do things. ok, that was a long winded post. I love your quilt - so pretty. The colors pop! Awesome quilt!! It is nice to go back to realize how far you have come! It looks great! The colors are so much fun. :-) You're post today, just makes me happy. You are so correct, Norma. We learn as we try new things and do things repeatedly. I know how far I have come. And also have much more I can learn and improve. As a beginner, thank you so much for posting this. I started about a year ago and did one "ABC" class to learn some basics. I kind of vowed that I never wanted to piece anything! It is encouraging to see that it does get better with practice! I'm impressed. I've been working on precision piecing and I, also, am making progress. Your hard work paid off. That makes me think mine will as well. And the black is just awesome against the bright colors. Wow ~ this is stunning! My skills have definitely improved since I started quilting. It is fun to look back and see how far you've come! It certainly does sparkle! Nice design. Beautiful! Congrats! Agree with you on the journey and looking back. I have one of my very first quilts up on the wall just now (a wallhanging), mistakes and all. I did not know how to put on binding so just turned the back to the front and it is wonky as all getout. But the piecing and applique looks pretty darn good. Binding is now one of my favorite parts of quilting! What a great quilt! Great colors.